Mix gelatin with cold water until dissolved in a bowl. Add corn syrup to bowl and stir until dissolved. Mix in bird seed until evenly coated with gelatin/corn syrup mixture. Spoon seed mixture into cookie cutters half way and press firmly into place with a piece of parchment paper (helps to reduce sticking). Continue filling to top of cookie cutter and press firmly again. Push in a straw piece to create a hole making sure seeds are firmly in place around the straw. Do not remove. Place filled cookie cutters in the fridge overnight to set! 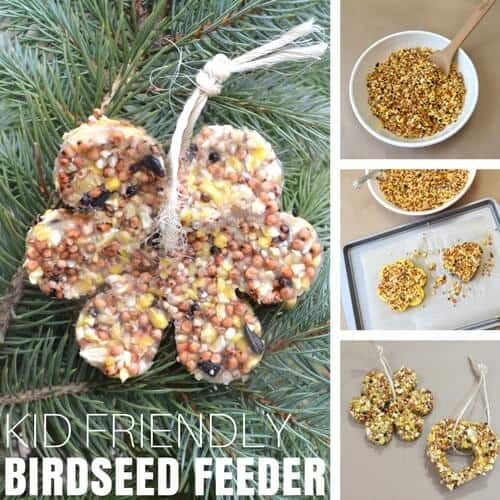 Once set gently push out your birdseed ornament and remove straw. Thread with twine and hang! Helpful hint: Place your feeder on a branch that is close to other branches. Your birds will need a place to perch to eat their treat!